It is crucial to exfoliate on a regular basis to help speed up the skin’s natural cellular turnover (which slows as we age). A lack of exfoliation leads to buildup of dead skin cells, which may yield one or more of the following: dull, dry or flaky skin, acne breakouts, clogged pores, and uneven skin tone. There are two ways to exfoliate: mechanically and chemically. Mechanical exfoliation involves physically removing dead skin cells, often with a scrub, e.g. Strawberry Scrub or Almond and Honey Non-Abrasive Face Scrub. Chemical exfoliation, on the other hand, involves a process using an acid such as an Alpha Hydroxy Acid (Glycolic Acid found in our Glycolic Foaming Cleanser) or Beta Hydroxy Acid (Salicylic Acid in our Acne Facial Cleanser)). Alpha Hydroxy Acids are best for sun-damaged skin, uneven complexion, and dryness, while Salicylic Acid is best for breakouts and congestion. However both Alpha Hydroxy Acids and Beta Hydroxy Acids help address clogged pores. Wondering if you can incorporate both physical and chemical exfoliation in your regimen? 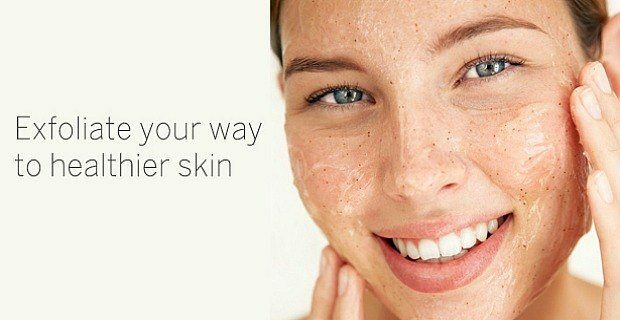 For most skin types (with the exception of inflamed or severe acne – in which case, face scrubs should be avoided) the answer is yes. Combination/Oily or Oily Skin Types should exfoliate 2-3 times per week. Use the Glycolic Foaming Cleanser twice a week, and the Strawberry Scrub once a week. Combination/Dry or Dry Skin Types should exfoliate 1-2 times per week. Use the Glycolic Cleanser once a week and the Strawberry Scrub once a week. Oily/Acne-Prone Skin responds best to products that contain Salicylic Acid, such as our Acne Facial Cleanser , which is gentle enough for daily use. Sensitive Skin Types should use the gentle , non irritating Almond and Honey Non-Abrasive Face Scrub.